I had just found out Sarah Palin visited Orlando this week, which is a shame because I would have tried to attend. I don't plan on commenting on her typical comments (anti-"Obamacare," military, financial reform, etc. ), but I did happen to notice something I would like to comment on - Palin made a joke about federal stimulus projects in Florida, referencing some sort of "turtle tunnel" in Tallahassee. It is safe to say that Palin does not know what she is talking about - she joked about the similarities between Florida and Alaska but only to urge those in attendance to watch her new television program. Michael Markarian wrote a piece for The Huffington Post last year that detailed this stimulus project that has been trivialized by those on the right - this all stems from criticisms made by Republican Senator Tom Coburn from Oklahoma regarding the stimulus. But when you look under the shell, the Florida highway project dubbed the Lake Jackson Ecopassage, which will help turtles and other animals cross a busy and deadly stretch of U.S. Highway 27 in Tallahassee, is not a fleecing of taxpayers. It's a wise solution to a pressing problem that makes the highway unsafe for drivers and a slaughter ground for wildlife. The community-based project is supported by local citizens, public officials, and the state Department of Transportation. It has been 10 years in the making and now, thanks to federal stimulus money, has the potential to not only help animals, but also save human lives. Here's how the story really began: Ten years ago, a Florida State University graduate student named Matt Aresco noticed a proliferation of dead turtles--some weighing 20 pounds--littering the side of Highway 27. When he got out of the car to take a look, he picked up 90 dead turtles in a third of a mile stretch of highway. Through painstaking research, he documented the highest rate of turtle mortality on any road in North America--more than 2,000 turtles per mile per year. Ninety-eight percent of the turtles who try to cross, Aresco found, get killed. Highway 27 was constructed before there were rules about protecting wetlands, and it sliced Lake Jackson, a state aquatic preserve, into two. The turtles--and alligators--follow the same route they've traveled for thousands of years, but now it's a death sentence. Sixty-two species of reptiles, amphibians, and mammals have been found attempting to cross Highway 27. I wonder if Alaska has to worry about over-development interacting with diverse ecosystems. I bet the couple thousand inhabitants of Wasilla had never even experienced an alligator in the middle of the road - I have. In all fairness, Alaska does have problems with road-killed moose, but considering Alaska's population is less than 5%, these incidents are far more rare then what occurs on a Florida highway. Palin points to just one stimulus project but ignores countless other highly important projects that help restore our state's infrastructure like storm water management facilities, pump stations, and water and sewer upgrades. I'm sure they are just as important as projects in Alaska, like the numerous multi-million dollar road repairs, which leads me to another issue I would like to address - a comparison of stimulus spending per person between Alaska and Florida. Alaska tops the list of stimulus dollars per person, with the stimulus covering $3,145 per person. Florida is at the bottom with $915 per person. Granted, Sarah Palin rejected stimulus money during her time as Alaska's half-term governor (a decision the Alaska Legislature quickly overturned), I think I would like to hear Palin criticize some of her state's funding first, or is she going to be like one of those Republicans who attack the stimulus but attend ribbon cutting events for stimulus projects? 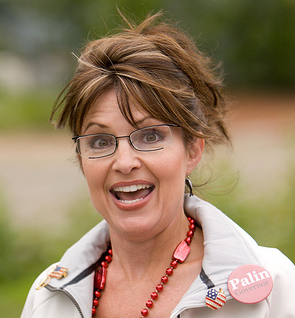 What bothers me is that Palin's speech is extremely generic. She uses the same material from every other speech she delivers and any new piece of information is rehashed from other sources. All she is good for is bringing in the crowds and spewing her partisan crap. I doubt Palin know of any of the other projects the stimulus is funding or what benefits they may bring to Florida - all she knows is what will get an applause from the Republican base. That stupid remark by Sarah Palin about the "turtle tunnel" brings back the memory of her ignorant remark about fruit fly research during the 2008 campaign -- even high school students know from their science classes (if they haven't been de-funded) that fruit fly research is a valuable source of data for disease cure/prevention research. The ignorance of Sarah Palin is almost painful, it's so profound. I don't like how Republicans like to rename everything to make them seem trivial or bad - death tax, nuclear option, turtle tunnels. <a href="http://thinkprogress.org/2008/10/24/palin-fruit-flies/>Here</a> is a good article from Think Progress that shows just how stupid Palin is - she called for funding the Individuals with Disabilites Act and for detection and treatment of autism but criticized fruit flies, which Think Progress points out helped advance autism research. Here is the hyperlink. You you missed a quotation mark.